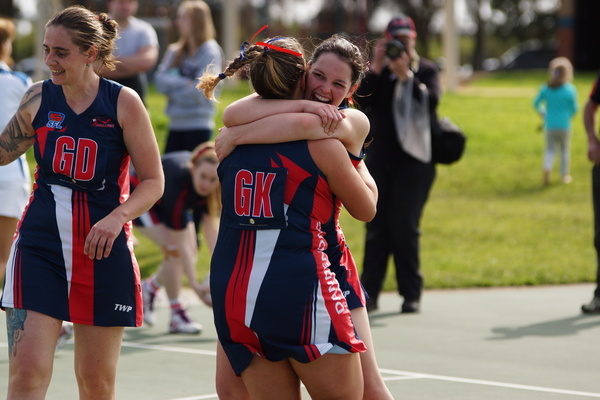 ONE year in the netball ranks was all it took for Dandenong Football Netball Club to claim a gutsy Southern league premiership. While Mount Waverley surged towards the final minutes – with fatigue and injury decimating the Redlegs’ goalers – Dandenong’s earlier brilliance through the second and third terms in particular saw them across the line to claim the Division-6 premiership 38-31 at the Springvale Netball Complex on Saturday. 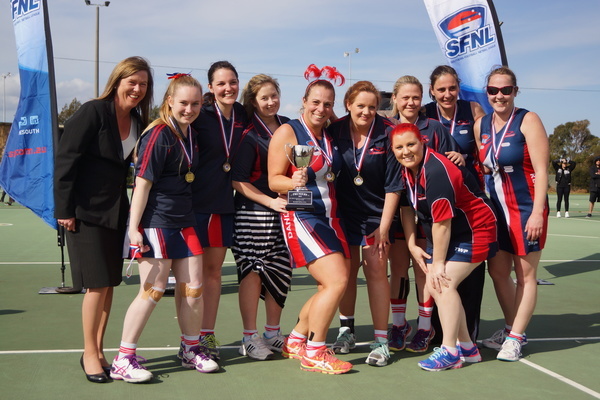 Dandenong Redlegs’ captain/coach – and best on court medallist Mandi Hall – said it was a phenomenal feeling to hoist the cup in the maiden season of Dandenong netball. “Inaugural year for Dandenong with a bunch of new girls – it’s amazing, easy bunch of girls to work with though and they deserved this right from the beginning,” Hall said. The girls gritted their teeth despite the challenges of their first grand final together – especially once they lost star goaler Corrine Pegram to a serious ankle injury. “Having our vice-captain going down in that last quarter – pretty badly as she’s waiting for an ambulance – it rattled us a bit and had to make some changes we weren’t ready for,” Hall said. 2015 has been on nothing but an upwards trajectory for the Redlegs since joining the association ranks this year – with Dandenong finishing second during the home-and-away season only separated by percentage to Mount Waverley. Hall wanted to thank the club for backing her desire to bring in netball along with her girls who fought it out all year to truly earn their flag. “I want to thank the committee and the supporters – the footy boys – for supporting me and my decision to want netball at Dandenong,” Hall said. Hall wanted to thank the committee and sponsor ‘Melbourne Online Motors’ for their support.